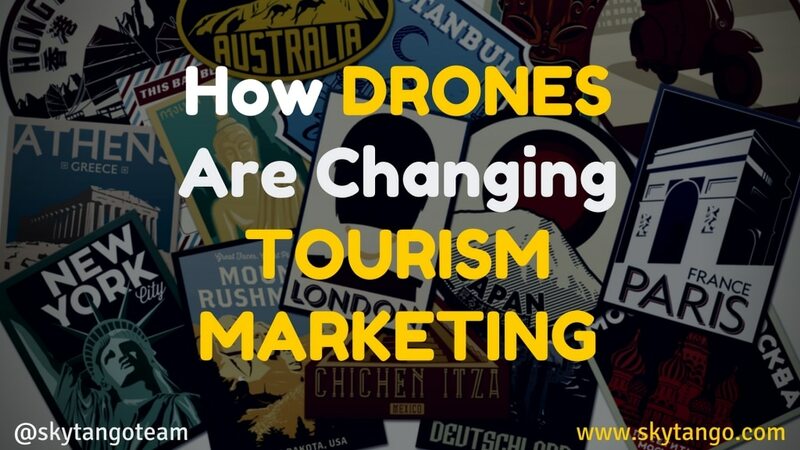 How are drones changing tourism marketing? Read how marketers and brands are using drones to promote destinations, hotels, attractions and niche tour operators. Drones represent a great marketing tool for the tourism industry, which has always been one of the quickest to adopt new technologies. Drones are indeed being used to create video content promoting hotels, resorts, destinations, attractions and tours. Luxury hotels and resort chains have been among the first to use drones, usually outsourcing the production to professional aerial filming companies. Speaking at the Connections Luxury Asia 2015 event in Beijing, mobile and communications expert Ewan MacLeod reported that several leading hotel and resort groups such as Waldorf Astoria and Conrad are replacing their traditional photo galleries on their websites with drone video footage. In 2014, Vista Celestial, a boutique resort located on the Pacific coast of southern Costa Rica, hired Sky Shots Productions, an aerial video production company based out of Los Angeles, California, to help them promote the opening of their hotel. Hotel owner Konrad Rzasa, mentioned on Hotel Executive said that the main reason for hiring an aerial filming company was that “with a 15 acre property, surrounded by the jungle and primary rainforest, nestled 2km up in the mountains, overlooking the Pacific ocean with surreal views from every point of the property, a standard video or photograph simply would not do the property justice”. Vista Celestial Promotional Video from Sky Shots Production on Vimeo. Destinations have been quick to catch on to the trend, commissioning or producing videos that integrate aerial and ground shots to better showcase their amenities and surrounding attractions. In 2013, the Norwegian city of Trondheim and its tourism board (Visit Trondheim) commissioned a video to showcase the beautiful city and its outskirts. The video showcased mainly drone acquired aerial footage. Visit Trondheim’s project manager Sven-Erik Knoff, quoted on Tnooz, said that the idea was to go beyond the “traditional” easy of presenting a destination: “The production company wanted to combine helicopter and drone photography in a way never before seen in order to get closer to the attractions and to get a closer view. I think this is the future of presenting destinations, showing the audience something they can’t do themselves, even with a great camera”. The video, which went live in February 2014, was produced by the Norway-based film production company Fram Film and Natural Light, with drones operated by aerial cinematography and photography provider Cinecopter. The final cost of the video was less than $30,000, including licensing and agreements – a fraction of the cost of some destination videos. It had a great success online, reaching 50,000 views in the first few weeks (it has now over 200,000 views). In 2014, the Australian Tourism and Events Queensland, in partnership with Sunshine Coast Destination Limited launched the million dollar #vacationmigration advertising campaign. Created by leading advertising agency Publicis Mojo and Taxi Film Production, it was inspired by the Wandering Tattler bird, a bird which each year migrates from North America to Australia for a break from the cold winter. A key element of this campaign was a 60-second video, directed by aerial film specialist Justin McMillan. Drone technology was used to provide a ‘bird’s eye’ view of the destination, literally following the path of the bird. Sunshine Coast Destination Ltd (SCDL)‘s CEO Simon Ambrose said that the new technology was the best means of capturing the dramatic natural beauty of the Sunshine Coast. As for other industries such as advertising or real estate, the disruptive potential of drones has created a market for aerial filming companies specialized in travel and hospitality marketing videos. The Atlanta-based Barnes Creative Studios, for example, focuses on the production of aerial videos for marketing luxury travel destinations and has worked with top brands such as Starwood Hotels and Resorts Worldwide and Viceroy Hotels and Resorts. Their videos usually integrate aerial and ground filming with a cinematic approach to show the beauty of the resort, its features, and natural surroundings, in a movie trailer-type video. The St Regis Punta Mita Resort from Barnes Creative Studios on Vimeo. Les îles Marseillaises par drone (Frioul, Planier, Riou, Château d’If) from DroneCast on Vimeo. Even more traditional video production companies, creative agencies, and travel marketing agencies are incorporating drones and aerial filming into their productions. Travizeo, a UK-based company producing travel video campaigns for the travel industry, has been using drones in their videos for years. D.S.Emotion, a Leeds-based creative agency specializing in destination marketing, often uses Augmented Reality and drones (collaborating with IronBird, an aerial cinematography company) to help create innovative branding campaigns for their clients, such as Q Hotels and Silverstone. Angus Armitage, director and co-owner of DS.Emotion, said in an interview with Forbes on innovative creative branding with drones: “The quality and style of filming we can achieve through the use of drones is more akin to big budget movies, not comparatively modest place marketing budgets. With strong placemaking principles behind a campaign, the use of drone footage enables us to visualize the values and essence of a place we have identified and prove the integrity of these messages that we could not do before”. The Nam Hai, Hoi An Luxury Hotel, Vietnam from VIP Worldwide on Vimeo. The benefits offered by drones are NOT limited to hospitality or travel operators with big marketing budgets. Several niche tour providers and local operators are reaping the rewards of utilizing drones to market their business, often limiting their expenses to the affordable cost of drones, cameras, and accessories. A well-known example of low-budget and high-success drone marketing campaign in the industry comes from Orange County, California-based whale-watching tour providers Captain Dave’s Whale Watching & Dolphin Safari and Dana Wharf Sportfishing and Whale Watching. Both of these companies fiercely compete over nearly 12 square miles of wide open sea, and since 2014, have regularly used drones to provide aerial video footage and photos to their website and social media channels, as well as to broadcasters, news channels, outdoor and action sports websites. Dana Wharf was the first to use a drone equipped with a GoPro camera to capture videos of dolphins and whales and has reached more than 8 million viewers on their DanaPointWhaleWatch YouTube channel. However, it was Captain Dave who managed to garner the most success from their drone videos. One of Dave’s videos, “Drones Over Dolphin Stampede and Whales off Dana Point and Maui“, went viral and amassed a whopping 11 million YouTube views, in addition to being featured on ABC, CBS, NBC, Discovery Channel, National Geographic, Al Jazeera and more. Another great case proving the marketing potential of drone videos for promoting niche tour operators and destinations comes from Matador Network‘s “Exploring Palawan’s Perfect Beaches From the Air” video. This three-minute video, filmed by Scott Sporleder with a GoPro Hero 3+ installed on a H3-3D gimbal, flown on a DJI Phantom 2 drone, was released in 2014. It has reached over 1 million views on YouTube to date and the Matador Network‘s website alone has 9 million monthly visitors. Travel marketing is not new to influencer marketing – that is, the practice of using influencers to create content for use primarily on social media platforms, building awareness in the audience of the influencers, and driving engagement, reach, and traffic to the brands that hired them. MediaKix mentions a few recent cases of influencer marketing in travel. Increasingly, we will see aerial filmmakers and influencers using drones in the pool of content creators picked by brands. Ross Borden, co-founder and CEO of the Matador Network, said in 2015 to Skift: “Practically every destination and major brand we work with is now asking for aerial video in the branded content we produce for them”. Matador Network is just one of the leading companies working to connect tourism marketing organizations with high-quality aerial content producers, but several others are following. Beautiful Destinations is another leading travel influencer specializing in Instagram, where they have a community of 6 million followers. They, like Matador Network, also offer visual content creation, influencer marketing (on Instagram, Facebook, YouTube, Vine and Snapchat), and data & analytics services to tourism organizations. And they also confirm that drones are going to play a very important role in the travel visual content of the near future. As Jeremy Jauncey, founder of Beautiful Destinations, said in an interview on visual marketing innovations: “We’re very, very heavy into drones. We think drone content is going to be a massive part of the market. It’s such a completely unique perspective on a travel experience. From innovative tourism boards that are just looking to share content about their location in a different way to hotel properties that perhaps never had an aerial perspective of their property or traditionally have used big choppers to actually get that shot where now they can actually have drones do that”. A further trend which I expect will impact visual content marketing in travel will be the integration of drone UGC (user-generated content) in the marketing strategy of tourism brands. Drone UGC (user-generated content) is still an unchartered territory for the hospitality and travel industries, even if there have been a few cases of destinations and attractions successfully taking advantage of aerial videos created by others. Visit Scotland, for example, managed to benefit from an epic mountain biking video that went viral. The video, Danny Macaskill: The Ridge, was produced by Cut Media and funded by the brands Five Ten, ENVE Composites and Santa Cruz Bikes, and shows the professional mountain-biker Danny Macaskill on a breathtaking trail on the Isle of Skye. Brands should aim at moving the engagement towards the more engaged levels: content creation and collaboration. The success of Travel By Drone, a popular website that allows users to upload drone videos of destinations around the world, shows that customers are already creating aerial content on a large scale. It may be the case that the more drones become a mainstream gadget, the more local authorities will relax drone regulations and allow drone flights in safety, the more drones will be able to autonomously fly and follow the user, the more tourists will travel with drones…and the more drone UGC (user-generated content) will be created. There is already evidence of drone tourism and drone tourists, like Danny Sullivan, traveling with drones and taking aerial videos and pictures as a complement or alternative to ordinary camera shots. If tourism organizations and marketers haven’t yet started to take into account drone content and drone user-generated content in their marketing strategies and haven’t started to move their audience toward drone content creation and collaboration in their customer engagement strategies, they will do it soon.